1) Find a square: (Multiplication tables, colour shape recognition) All the students are asked to stand on a square that contains a specific colour, 1 child per square. Ask the children what number they are standing on and try to find its relation to a multiplication table (see section Mathematics) The game progresses through the times tables with less squares being available each time like musical chairs. A fun variation is that the children who have found a square join hands and those who didn’t wait outside the magic square and form a human train and try to pass through the children on the magic square without being touched. Alternatives can be find a shape (circle, triangle) or find a square with an animal etc. 2) Find the number:(Counting, sequencing) Not all numbers are painted onto squares so ask the players to deduce the missing number. 3)Dice /card games: (basic arithmetic operations) Divide the children into teams (ideally 4 – 6 per team). Using 2 dice or number cards. 2 numbers are generated for each team. At the same time the numbers are revealed and the teams have to multiply, add etc. the numbers. The first team to stand on the square with the correct number wins. 4)Move the robot: (directions and co-ordinates)These games can be demonstrated by the facilitator or a student pretending to be a robot and getting the players to call out instructions (1 specific instruction per student if working in big groups). The “Robot” moves around the square following directional instructions up, down, left, right, horizontal, vertical e.g. Move up, move down, move 3 up and 2 left (arrows can also be used). A goal can be given find the flower square and the teams have to direct by “remote control” instructions how to arrive at the destination. For more difficulty, various squares in sequence can be looked for. E.g. Snakes and Ladders: dice are rolled by the players and that number is found, advanced, retreated, multiplied etc. as the players try to be the first individuals or team to reach 100. Long sticks and skipping ropes can be added to represent the snakes and ladders or a specific colour or type of square can be designated a specific meaning e.g. If you land on a green square advance to the next green square or if you land on the beach story square miss a go. Inventapuzzle: The student or teacher invent their own problems such as: Add together all the numbers of square in a particular row, column or diagonal. Multiply the numbers of the squares with a certain geometric shape in them. Divide the number of squares on the chess board by the square with a house. Add together all the squares that contain the colour green etc. Tell the children to imagine that the magic square is a river a forest a planet or whatever they want to imagine. 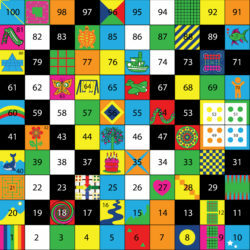 Tell each child a colour that appears in the magic square and ask them to try and cross the “river” only touching squares with that colour. Smaller children should be given the most common colours (green, yellow, light blue) and older children should be given the less common colours (pink, dark blue, orange) which require larger jumps. Forming teams (4-8 ideally) outside the magic square on each of its sides. The teams throw bean bags, soft balls, plastic bottle tops and try to hit a specific square (“the cake square”, “a square with orange in it”). Each team scores 5 points if they touch the hit the square but the projectile doesn’t stay inside and 10 points if they manage to remain in the square. Teams keep track of their totals. The children are led around the outside of the magic square when all children are around the perimeter the leader enters at the number 1. The intention is to make a square spiral and the arrive at centre of the magic square (squares 45, 46, 55, 56). The route is as follows 1 – 10 up 10 -91 left 91 -100 down 100 – 12 right 12 – 89 etc.) An alternative version is like a snake 1- 10, 11 – 20 , 21 – 30 or 100 – 91 ,90 -81. Story games (Language skills, narrative, imagination) The story squares are useful in narrative development and a facilitator jumps from story square to story square the children then make a story inspired by the pictures. Alternatively, a series of numbers or coordinates are given to form a narrative. E.g. Get the children to make a story e.g. 12+15+20 = I left my house (12) went to the mountain (15) and then for a swim at the beach (20). Mixing both math and language in a blended learning experience. The facilitator or the students tells a story including things seen in the magic square. The other players listen, remember and then e find the squares and repeat the story adding another (square) element to the story. Guessing games can be invented such as choose a square, describe certain characteristics and then let the children guess which square is being described. The majority of the above games can be used with the addition of an element looking at emotions /feeling e.g. jump on the green squares with a happy, angry, relaxed face/body. Free play: The games children invent themselves encourage confidence, creativity and sense of involvement with their educational surroundings. Use the Magic Square as a whole, a section or an individual square letting the children explore through play. The facilitator should use encouraging language and maintain a respectful setting.